The curriculum guide helps you prepare yourself and your classroom for a new approach to science learning. It then assists you in planning open and focused explorations, ranging from indoor terraria to outdoor animal searches and habitat discussions. You will also learn how to better observe, assess, and document the children's learning. "I've learned to take the children's lead, using their theories as a starting point, then helping them think about how they might test out those theories. And by helping them test their theories, they're able to refine their thinking, and develop new theories that lead to new questions and deeper investigations." 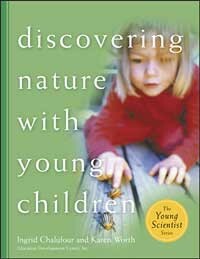 —From Worm City: Excerpts from a Teacher's Journal, Discovering Nature with Young Children.